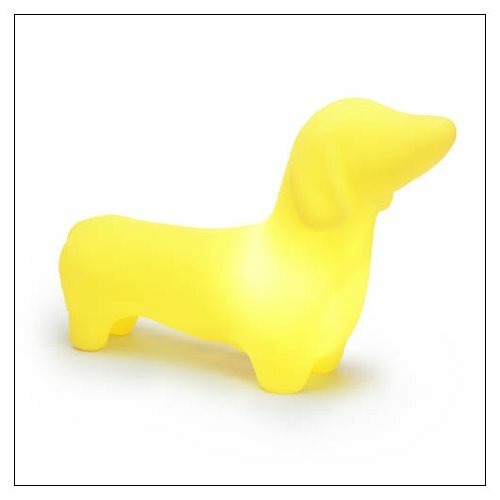 OFFI Home MEGDAS-Y Dachshund Accent Lamp glows a bright, sunny Mellow Yellow and will bathe your room in a welcoming glow. Dachshund is made of non-toxic, odorless plastic. Whether used as the perfect night light or a warm accent fixture, the happy little Dachshund will give you a warm feeling as a constant companion that will be appreciated for a lifetime. MEGDAS-Y is supplied with a cord and adapter UL approved for indoor use in US households (110-Volt, 50-60Hz power). MEGDAS-Y comes one per package, and includes a 10-watt 12-Volt G4 base halogen bulb. OFFI and Megasii have been working together since we developed the Tiki Stool in 2004 and worked with Megasii engineers to finalize the tooling. From there we formed a unique partnership that continues to deliver new products in the marketplace each year. On the design front, Megasii aims to "create extraordinary lighting and furniture illuminated from within to bewitch a room with enticing and surreal sensations." We have certainly become "bewitched" by their designs. OFFI and Company was launched in 1997 out of the love for great design. This passion is satisfied by creating simple, beautiful and practical furnishings that address the modern urban lifestyle. OFFI products are created to be multifunctional, comfortable, and at home in any modern home in the world. By guiding and nurturing a group of independent international designers such as Scott Wilson, Karim Rashid, Eric Pfeiffer, Truck Product Architecture, Roberto Gil, and Tarantino Design, OFFI has launched more than 100 fresh new products in the last ten years. OFFI, as well as several of the designers, has won prestigious awards for furniture design during that time. Now offering work surfaces, lounge seating, storage solutions, organization accessories, and a growing "kids" collection, we are committed to delivering great design by continually creating the most innovative furniture solutions for the modern urban lifestyle.